My word, the weeks are flying by. Hard to believe that we are almost half-way through this year. The more I create, the quicker the days seem to pass. I've been drawing steadily and I've become somewhat obsessed with lines. I've drew loads of them and regularly come up with stuff like this. It's great fun and, at the same time, very meditative to just lay down line after line. I've also been experimenting with colour. I do love using my Pitt Artist Pens. The ink flows onto the page so smoothly; so different to all the pens I've tried previously. I drew the image below, more lines, added colour with my pens then overlaid the scanned image with my photo editing software. I lifted off some of the overlay to let the original colour show through. I like the result a lot. I think it works really well. Why not pop over to Instagram to see all my latest work. Hi, Valerie. Thank you for commenting. I love organic shapes, too. 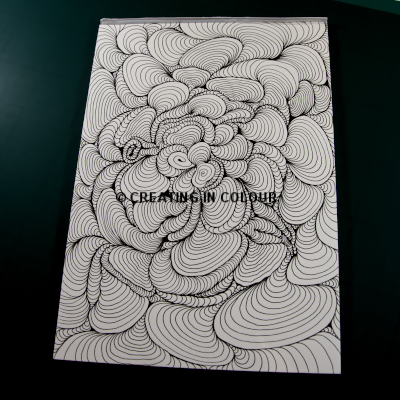 You are a master with doodling. You did really amazing drawing and the adding of colours is wonderful! Hi, sirkkis. Thank you so much for your kind words. Gorgeous! I really love the flow of the lines. So funky! John!!! these are simply gorgeous. They both have a bit of Dali essence to them. The first one draws me in and takes me on a trip. The movement is amazing. The second one at first seems peaceful like a garden then my eye goes deeper and there is all kinds of surprises and again great movement to your art. You are an amazing artist. Well done my friend. Hi, Nicole. Thank you very much. I'm glad you like them. Your words flatter me. First off- sorry I forgot you when i titled my post about girlfriends. But then if I would have said "and boyfriends" that wouldn't have been right... so, hey guy friend! 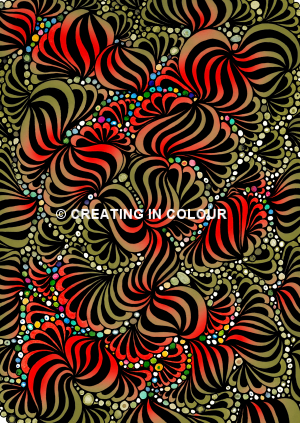 Your meditative doodling is brilliant- and the colored one- spectacular. Happy PPF! Hi, Linda. I was only joking about the title of your post. No offense taken. Thank you for your kind words on my drawings. Thank you, Gillena, for commenting. Very much appreciated. Hi, Beth. It's hard not to get lost in the lines. The process just takes over. I love lines too. They can give such an awesome result. These two pieces of yours are gorgeous. I can't imagine how you did the colour in the second one, but it's beautiful. I understand that you are pleased! Thank you, denthe. Lines are cool. Glad you like my pieces. The second one was an experiment, but I think I'll be doing more like that. Thank you, NatureFootstep. I like to try and make my drawings have an organic feel. Hi, Rasz. Thank you for dropping by. I'm really enjoying IG, and it's nice seeing your work over there, too. Doodling is great when your feeling under the weather. Enjoy it and go with the flow. The rest will take care of itself. I agree, I'm entranced with line. My blog is Not Afraid of Color but it's line lately. Hi, LA Paylor. Thank you for visiting and for commenting. Yes line is super. Great doodles, I like them both. I'm a fan of Pitt pens too. And doodling. I can't believe we're already in mid June either. Where's the time going? I love the lines and organic shapes of your drawings. They look fabulous both in black and white and colour. Hi, Nordljus. This year has really flown in. Thank you for your kind comment.